I seem to be doing nothing much but reading at the moment, however by the end of the Easter holidays I need to be sure of what I am going to make or it is going to be pretty hard to get together a whole solo show by July (unless I look for a very small venue). I have a back up plan - a booking for an unfinished upstairs gallery, but I'm looking for somewhere on street level if I can find something suitable. When the Rivers Run Dry - Fred Pearce. This book was a bit of a revelation. He mentions the term 'Virtual water'. This is the economists term for all the water that was used to produce a manufactured item. It was invented by Tony Allan of the school of Oriental and African Studies in London. New Zealand sells kiwifruit to overseas countries and is therefore exporting water inside the fruit which ends up in another country. Which is Ok for us, at least we have rain (often a bit too much rain). But what if it is a dry country exporting tomatoes which have been irrigated - the amount of water inside the tomato is added to the water that was used to irrigate the tomatoes. The 'Virtual water' count can be huge. Fabric grows in a hot climate and needs lots of water for irrigation, then gets dyed, rinsed and rinsed and rinsed then scrubbed and faded (In the case of jeans). The Virtual Water count for cotton is enormous. If it takes 25 bath tubs full of water to grow enough cotton for a t-shirt then it is probably similar for a metre of quilting cotton. The water for growing cotton is being pumped out of rivers and used to irrigate the cotton which is grown in very dry places, almost deserts, and this is causing the rivers to run low and in some cases dry out. Have a look here for pictures of the Aral Sea. This is before the fabric gets dyed and rinsed and then taken home and washed to remove the starches and finishes and to shrink it. The water was pumped out of the rivers which feed the Aral Sea to irrigate cotton. Now I love cotton, and I love to dye cotton and I'm no purist but I'm starting to think about the implications of my choices of materials so I'm reading books on sustainability. I haven't found many books by contemporary quilters which consider the environmental issues of the materials they are using. However there are lots of people in the fashion industry who are looking at becoming more eco-friendly or sustainable in their work but there are so many factors to consider. 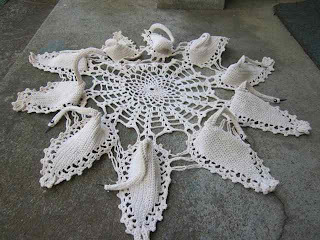 You can recycle and use up scraps - quilters used to be very good at this and to be fair, some still are. But it is pretty hard to do all of this at the same time. So I have an idea for an exhibition but it involves lots of 3 metre long white fabric lengths. I would have had no difficulty in the past in buying a 50 metre bolt of homespun and getting started but now I'm having to consider how I am going to get the fabric by other means. What if I buy the 50 metre bolt of new fabric and promise to use very scrap of fabric? Does that count? Or should I try and find organic cotton (and believe me that doesn't seem to be an easy task). And in my heart of hearts I'd love to use cotton organdy, which is white and crisp and has been treated with starches and chemicals causing goodness knows what environmental problems. Now time for some more light-hearted stuff. 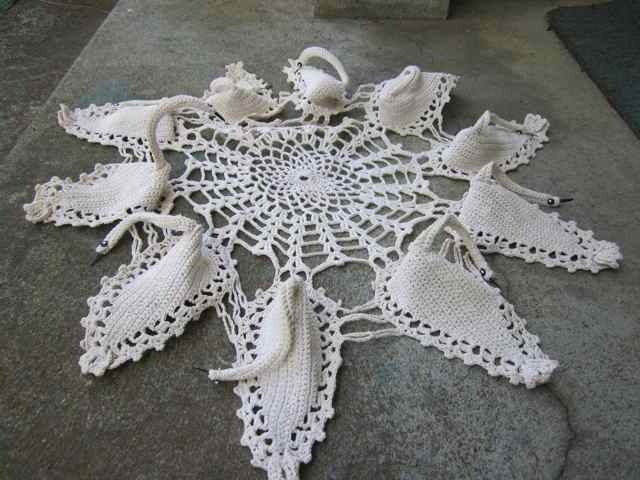 Check this website for weird craft. Here is something I found in a op shop in Wellington, New Zealand. 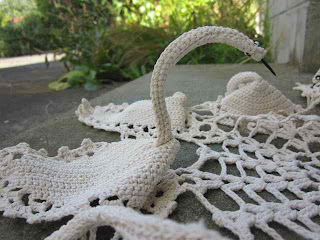 Its a crocheted doiley with swans. Anyone know what is is for? Is it just decorative or does it hold scones or something? I have been using khadi cloth which is hand spun and woven, unbleached not sure what it's water footprint would be but it is made in arid areas in India. Another way of looking at your exhibition is to use up all the cloth you have- I have not been dying fabric as much as I used to and am trying to use up every skerrick of fabric I ever dyed to print and utilise in the making of small sentinelle pieces- all the bits that I put away because they weren't right- it's getting through quite a lot of my stash and is repurposing fabric which would otherwise have sat in the cupboard. Asia Gallery as you know have a fair whack of fabric and I've seen cotton there. I know Trash Palace and op shops also have lots of old white sheets (usually in the painting drop cloths box) with the odd marks. And when hotels replace their sheets, you can pick up a heap of sheets that way too if ur not too fussy where they come from. Good dilemna to have as it can often change the direction of work out of necessity. All the best Clare.